Boeing has received a performance-based logistics (PBL) contract modification from the US Department of Defense (DoD) to continue providing support services for the international C-17 Globemaster III military transport aircraft fleet. Awarded as part of the C-17 Globemaster III Integrated Sustainment Program (GISP), the $2bn contract extension covers support for a total of 246 aircraft that are operated by the US and global air forces for military and humanitarian airlift missions. Under the contract, the company will provide forecasting, purchasing and material management for C-17 aircraft as well as related support to reduce ownership costs starting from 2013 to 2017. Boeing vice president and GISP programme manager Gus Urzua said the new contract testifies long-standing partnership that exists between the company and US Air Force (USAF). The PBL-style contract enables customers to pay for a specified level of readiness versus individual parts or services, simultaneously allowing the company to cost-efficiently enhance aircraft availability through application of innovative spares forecasting and modelling tools. Under the GISP programme, Boeing works closely with the USAF to manage C-17 sustainment activities including field support, depot-level maintenance, supply-chain management, as well as aircraft modifications and upgrades. Powered by four Pratt & Whitney F117-PW-100 turbofan engines, the C-17 Globemaster III is a large military transport aircraft designed to conduct rapid strategic airlift of troops and supply palleted cargo to main operating bases or forward operating bases worldwide. The airlifter can also be configured to carry out additional tasks, including medical evacuation (MEDEVAC), airdrop missions and also support humanitarian and disaster relief efforts. The aircraft is operational with Australia, India, Canada, Qatar, UAE and the 12-member Strategic Airlift Capability initiative of Nato and Partnership for Peace nations. 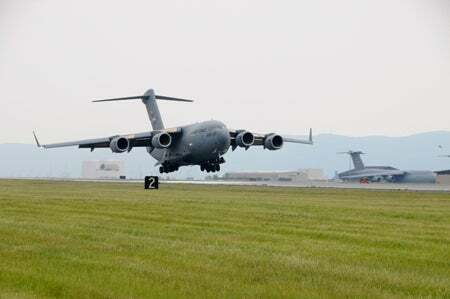 Image: A US Air National Guard’s C-17 Globemaster III aircraft lands at Stewart ANG Base in New York, US. Photo: courtesy of the US Air Force.